The directory of artists, photographers, and creatives of the United States. We ran across a great resource for cross stitch enthusiasts who may want to get some free cross stitch patterns and we want to share them in this freebie post. We would also like to recognize our artist directory member, Caralyn Edwards of Mystic Reflections who creates beautifully detailed fantasy art sculptures from polymer clay. We’ll have more info on her work for you toward the end of this post, but first lets get on with our topic concerning free cross stitch patterns from Sullivans. Sullivans Project Central has some great, and free cross stitch patterns you can download for quick projects. You will find a Spring collection which includes a “Bluebird”, “Geraniums”, and “Gardens” themed project. In the Summer collection there are “Flip Flops”, “Sandpail”, and “Sailboat” projects. The sailboat photo at the top of this post is the sailboat project included in these free downloads and it would make a great project to make, frame, and then hang in your bathroom. In the Autumn collection there are “Fall Leaves”, “Harvest Time”, “Autumn Quilt”, “Best Witches”, “Pumpkin Smiles”, and “Witch Hat” themed projects. There are six more patterns in the Winter collection which includes “Hot Cocoa”, “Flurries”, “Snowflakes”, “Holiday Wreath”, “Joy”, and “Santa With Bells” projects. You can find all of these great patterns at Sullivans Project Central. It should be noted that the page also includes links to some Glendonplace patterns for purchase, however if you surf those links you will quickly find that apparently the website owners at Sullivans haven’t done a great job at maintaining thier website (or at least that page) since the links do not point directly to the exact products they are linking to. We found that you can still find the items by searching for the titles on the Glendonplace website, and we suggest browsing thier website for great products. Glendonplace even has a printed catalog you can buy if you prefer catalog shopping. UPDATE: Upon further research, it appears you can download these patterns and more here. Follow our blog for more freebies to come, and follow us on twitter @nwoaart so you don’t miss any of our blog posts as we bring you the best of America’s artistic talent and interesting things on the internet. That’s it for this post, however we would also like for you to visit Caralyn Edwards of Mystic Reflections who creates beautifully detailed fantasy art sculptures from polymer clay, and then hand paints them herself. 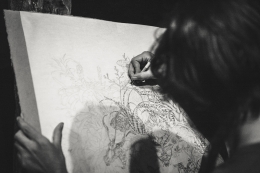 Her detailed creations will take you to a new world of imagination. She never uses a mold and every figurine varies in size and uniqueness. We’re sure you will want to collect every figurine she has created if you love fantasy art. Are you an artist, photographer, or crafty person residing in the United States who would like to have your work featured in our blog posts? We would love to have you in our directory, and we would love the opportunity to help you connect with new fans of your work. 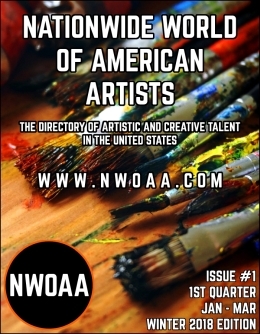 Please visit our listings page to find out how to join our directory and start getting promoted by the Nationwide World Of American Artists (NWOAA) Directory today. Posted on October 10, 2017 by David ThriftPosted in Free StuffTagged Art, Cross Stitch, Embroidery, Free Stuff, Glendonplace Patterns, Sullivans. We are now accepting applications from artists, crafters, and photographers to be featured right here in our brand new Guest Artist Of The Week Program. Please click here for details and to apply. For long term exposure in our artist directory please visit our listings page to get listed. We'll soon have some wonderful opportunities for bloggers to get some free promotional exposure on our website in our brand new Blog Of The Month Program. Please click here for more details. Great art cannot exist without a devoted audience. 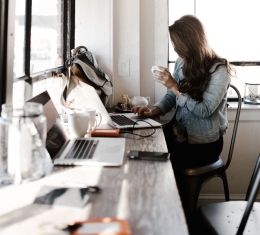 The NWOAA, scours the web looking for the most talented artists, photographers, and crafty creators in America to promote and help them connect with interested buyers of their work. Our mission is to provide the most trusted source online for all who are interested to find great American artistic talent in all 50 states of the United States. We also provide content such as podcasts and music selections on our blog for artists and site fans to listen to. Our artist promotion efforts include directory listings, promoting artists work on twitter at @nwoaart, as well as writing about the latest work produced by directory members. 3,562 visits since Monday, 08/21/2017. Privacy is extremely important to us, and is strictly guarded for everyone participating in any program on our website. Any information received is used only for communicating with the person it was received from for direct communication with that person only. We do not disclose private information to any third parties for any reason. Our directory listings will only contain information given permission to post by our directory members. © 2018 – All rights reserved! You may link to our pages, or blog posts, however unless otherwise stated, use of our content on other websites or blogs is forbidden without written permission of this domain’s owner. This includes images, and text.